Do you enjoy multi-use trails, bike lanes & sidewalks in Dunwoody? Want to know some juicy details on the history of some of these projects, how they came to fruition and what it takes to make ideas become reality? 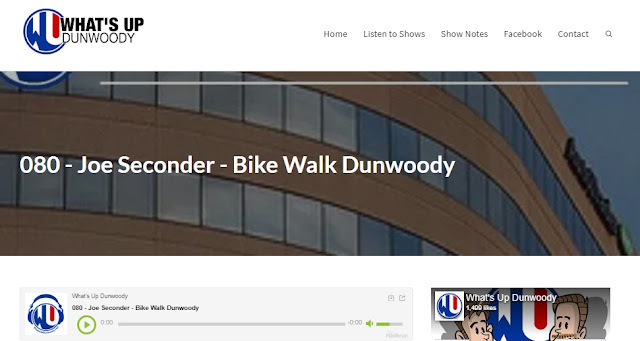 Listen to Part I of my interview on this podcast by What's Up Dunwoody In Part II, we'll talk about regional trails and how we'll eventually connect to the Beltline and more! Editor's Note: Okay, so I received this award in February, 2018 and now it's April, 2019. Yes, it's basically not "timely", but what the heck. Better late than never, right? Receiving the 2017 City of Dunwoody Sustainable Hero Award. In February, 2018 I was honored to receive the City of Dunwoody Sustainable Hero Award for 2017. It was presented during the annual State of the City address, where various civic leaders provide updates and talk about their achievements, plans and vision for the future of our community. If you care to spend five minutes of your time, feel free to watch this video of my acceptance speech*. Normally, I'd have spoken a bit slower with more pauses & emphasis. But this was a diverse crowd and I didn't want to monopolize the evening. I give many thanks to my wife, Kathleen for giving me a long leash and letting me attend various community meetings day & night over the years. She's been a huge supporter of my efforts in working on our city to become a safe place for folks to simply jump on a bike from their house and ride a mile or two around town. Hi. I’m the “bicycle guy”. I’d first like to give a big shout out of thanks of support to my wife, Kathleen. 15 years ago on Valentine’s Day, I hung up business suit, put on my US Army Desert BDU’s as an Infantry Major in the Reserves, kissed Kathleen goodbye and deployed to Kuwait to an unknown future before the invasion of Iraq. I returned a year later. 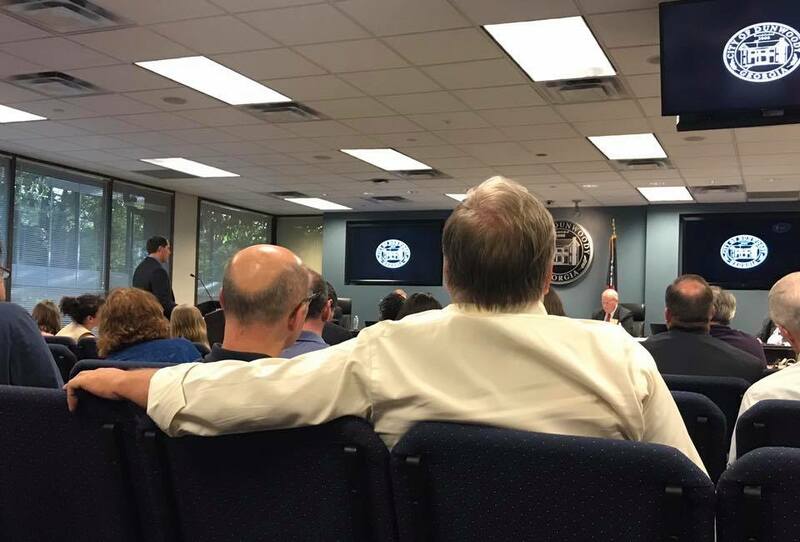 Now I kiss Kathleen goodbye when I head off to attend a public information open house, city council or DHA meeting, meet with staff from the city, GDOT, Perimeter CID, neighboring cities, elected officials and fellow advocates. And come home – USUALLY -- only a couple of hours later. Along the journey, I’ve been blessed to develop great friendships, build coalitions, experiencing human-powered fun times outside simply surrounded by air, had joy & some disappointment; and yes – new sidewalks, bike lanes and trails; It takes a village. This award is not simply about Joe Seconder. And I’d like to call out and recognize some of the people and organizations who have helped along the way. From the working parents with a cram-packed schedule that can’t make it to an evening council meeting, but send an email or tell their friends & neighbors of a particular initiative. From the folks with Dunwoody Preservation Trust & Lemonade Days for allowing me to serve for 4 years as the ride director of the Bicycle Ride around Dunwoody (Thanks to Danny Ross & Sam and Molly Portis) From the volunteers with the Dwy Women’s club who assisted in putting on a children’s bicycle safety rodeo in Brook Run. To the 70+ year old retire just coming off dual knee replacement surgery whose doctor said that bicycling would be an excellent way to rehab – in asking for safer places to ride a bike. To the individuals, sponsors & merchants who have made donations, provided support and even free custard after rides! To the Dunwoody Police Department, for their continued enforcement, education, escorts for events and support of activities. To anyone who has “just showed up”. To a public meeting, spoken out, provided feedback or volunteered. Like the crew running the Monthly Community Bike Ride (first Sun of each month at Village Burger) – Shout out to the Metzger’s, the Miller's, Glen Engels, Karl Welsher and the rest of the crew! To our city staff, who are proactive in engineering and creating safer & Complete Streets for all. And lastly but not least, our elected officials. From Council 1.0 in 2009 when I was a cold-calling stranger pitching the benefits of a bicycle friendly community, to today. You have been accessible, open and have put in place the plans & policies - backed up with budget priorities -- to move the needle forward. Is the Glass is half full or half empty? Who would have thought 10 years ago that a person could get on a bike on North Peachtree & Peeler, ride over to Chamblee Dunwoody without ever getting on a road? In a few short MONTHS, you’ll be able to continue onto Old Spring House Lane – a neighborhood street -- and cross a new bike/ped bridge directly behind where we are right now -- and ride all the way to Alon’s, or Café Intermezzo. And in as short as the next FIVE years ----with the help of our friends in Sandy Springs -- , you’ll be able to ride from Perimeter on a separated facility / Trailway all the way to Atlanta, Buckhead, Piedmont Park, Ponce City Market and points beyond. So I’d say the glass is half full, and getting fuller every year! As Mayor Shortal closes out his emails, Let Us Continue to Build Our City Together! The following was omitted during the speech due to time constraints: In transportation planning and developer speak, you’ll hear about the term “Level of Service”. It’s about moving cars as quickly and efficiently as possible. Instead, let’s talk about Level of Service for humans. Safe Streets. For those that live, play & go to school HERE. We’re in the midst of re-designing our city & streets for people. When you’re out walking or riding a bike to school or the coffee shop, it’s humanizing. It creates a sense of place. It physically & metaphorically connects people together within our community. Reminder: Don't take good people in your life for granted. Miss you my friend, Bob Lundsten. Here's some great thoughts & perspective on the positive impact Bob made over the decades to the Dunwoody community over on Heneghan's Blog.